It's nice to return to bicycle travel writing. Nearly every cyclist who pedals from Summerlin to the Red Rock Canyon Conservation Area loop entrance is a roadie. But not Beth Geohagan, owner of BeFly Bike Tours in Lakeland, Fla.
She pedaled a fat-tire cruiser bicycle along the Nevada State Road 159 shoulder and steadily pedaled her way to the Red Rock entrance, then up the hill to the visitors center. It was no trivial matter to climb from 3.250 feet to about 3,700 feet to the visitors center on a cruiser bike. It's a sloping uphill the whole way, but Beth pedaled in true BeFly style. On the way home, we checked out the new extended Western Beltway Trail along the 215 and reached the bridge at Far Hills Avenue. There's only one way to get to a beer tasting. The beautiful Beth, my bicycle-loving cohort, and I pedaled from Symphony Park on the edge of downtown Las Vegas to Container Park on East Fremont Street for the inaugural last-Friday-night of-the-month beer-tasting event at Container Park staged by Motley Brews. Motley Brews are the same folks who put on the spectacular downtown craft beer festival a mere two months ago, drawing thousands of beer lovers to the 80 some beer tents along East Fremont and Sixth Streets. They are the go-to craft beer event organizers in this town. Brian Chapin, who I profiled for a story in March, is the head brew man at Motley Brews and he killed it again with the boutique-style beer tasting event at Container Park last night. There were only 20 beers being sampled, about a half-dozen beer tents, and several hundred people tasting the suds in the closed-off area of Container Park near the stage. One of the craft beer companies was Las Vegas' own Banger Brewing, located just a few blocks away in the Fremont Street Experience. Banger Brewing has a ton of fans, including Gov. Sandoval who slipped into the brewery early one morning to chat with the five guys who own Banger. Nick and Banger from Banger Brewing were in fine form at the beer tasting, killing it in a cool second-level space overlooking the stage with a trio of great offerings, including its signature and award-winning El Hefe, a jalepeno hefeweizen. Here, Beth checked some of the Banger Brewing head gear on display. Score a huge win for Chapin and Motley Brews by partnering with Container Park, developed by Zappos CEO Tony Hsieh and his East Fremont gang. It was impressive to see the Las Vegas-based critical mass of Hsieh's Downtown Project, which built Container Park, Chapin's Motley Brews and the boys at Banger Brewing pulling together in one direction at the first last-Friday beer tasting event that will run through the summer for July and August. I might be far away from Lakeland, Fla., living and bicycling in the Las Vegas area. But an amazing bicycle woman in Lakeland last year launched a super-original bike touring business called BeFly Bike Tours with a fleet of colorful cruiser bicycles. But she needs your help to gain a Wells Fargo grant to grow her amazing bike touring biz. So, please take a few seconds and vote for her here. After the RTC pulled the plug on the popular Viva Bike Vegas ride after it lost money, sponsorships and bicyclists in 2013, Tuscson-based Perimeter Bicycling has stepped up to put on the Viva ride on the Saturday after Interbike on Sept. 13. Sunday morning meant biking with my pal Scott. We meet at the Dunkin Donuts at Charleston and Desert Foothills and pedal west four miles to the Scenic Loop into the Red Rock National Conservation Area. At the overlook, we met a variety of people on two-wheelers. There was Norm and another fella on motorcycles. A guy named Jim on an electric bike. And a small cluster of bicyclists. SOUTH UTAH -- After a tasty dinner of enchilada pie packed with sliced zucchini, yellow squash and bison meat, two touring bicyclists -- Elizabeth from Utah and Nancy from Sacramento, Calif. -- strolled from their camp site at Bryce Canyon National Park to the canyon rim for a sunset peak. The tips of the canyon's tops were illuminated as the two bicyclists exploring southern Utah carefully followed a foot path some 8,200 feet high for inspiring views of the famed national park. Elizabeth and Nancy enjoyed the day-end visual treats as touring road bicyclists with Escape Adventures, a Las Vegas-based touring company that has taken guests for mountain bike and road bicycle tours in places from the Tetons in Wyoming to Grand Canyon in Arizona to the Pacific Coast in Oregon for the past 22 years. Jared Fisher of Blue Diamond, who owns bicycle stores in Las Vegas and Moab, Utah, launched Escape Adventures more than two decades ago. For this particular bicycle tour in mid-June, Fisher used his vast knowledge of south Utah for his seven-day road bicycle tour that includes the Holy Trinity of national parks -- Bryce Canyon, Zion and Grand Canyon. I joined the tour for the first three days to get a taste of a scheduled bike trip. I have bicycled across the country solo twice and have created urban restaurant bicycle tours in Tampa, Fla., but I wanted to see what it was like to pedal on an organized commercial tour. I pride myself on knitting together my own bike routes no matter where the place and I have a very quirky style of stopping to chat with people or take photos in a spur-of-the-moment way. I have been meaning to explore south Utah's amazing landscape of high country and stunning low deserts and Escape Adventures proved to offer the right balance of tour guidance and bicyclist autonomy. My two guides were a can-do pair of 20-somethings whose love for bicycling came through in an enthusiastic and caring fashion. Merrick Golz, 27, and Zephyr Sylvester, 23, led rides, cooked three unbelievable meals a day and struck the right balance of advising bicyclists in a friendly manner with a smile without talking down to guests. Both are avid mountain bicyclists with strong road cycling skills. Merrick and Zephyr formed a great team, making sure tires were inflated properly to gently reminding to be hydrated while doling out helpful anecdotal tips on the road conditions and elevation changes. The duo also prepared three stunning meals a day -- ranging from French toast in the mornings, to homemade pizzas complete with peppers and cilantro at lunch and appetizers and tasty dinners at night, including a splendid grilled salmon on the tour's first evening. The next night, a delicious enchilada pie was preceded with home-made chips and three different types of salsas. Zephyr took special care with breakfast, arranging a mini-pyramid of banana slices and sliced strawberries laid out like a mini-deck of cards before a hot breakfast was served daily. During the days rides, Merrick and Zephyr took turns cycling with the three of us -- I joined Nancy and Elizabeth on the daily rides in south Utah -- while the other drove the Escape Adventures van and trailer. On this day, Zephyr joined Nancy and Elizabeth for rides. Escape Adventures offers two options for biking guests to launch a tour. In this case, Nancy met the Escape Adventures crew at The Element boutique motel next to the Las Vegas Cyclery bike shop for the trip to St. George, where they had a rendezvous with Elizabeth and myself at The Crystal Inn off I-15. So, let's go and ride. While Bryce Canyon, Grand Canyon and Zion are the Big Three, there are other scenic stops along the trip that are noteworthy and something to write home about. The first day was a case in point. We drove to Cedar Breaks National Monument, an 81-year-old national park that offers a spectacular natural rock amphitheater at more than 10,000 feet. We lunched on turkey sandwiches with an impressive array of mustard selections and delicious soft apple cookies before we hopped on our bicycles for a five-mile ride in the hilly terrain around Cedar Breaks, before we took a right turn for a 15-mile descent to Panguitch Lake campground in the Dixie National Forest. The descent was amazing as I hit 50 mph thanks to the downward slope and tailwinds. Elizabeth, Nancy and I joined Zephyr for a casual nine-mile bike ride around Panguitch Lake, where vacation homes dot the gentle rolling hills lining the lake. Zephyr, who started on the job in May 2013, enjoys meeting the array of guests such as Nancy and Elizabeth. Both enjoy road cycling, with Elizabeth cranking up the hills and Nancy going slower and having her two trusty Nikon point-and-shoot cameras at her side. "I meet so many cool people from every field," said Zephyr, who grew up in Vermont and attended Whitman College in Walla Walla, Washington. The first day was an easy 27 miles -- and it was a pleasant start for the tour to see the spectacular Cedar Breaks, which sometimes gets lost in the shuffle amid the higher-profile canyons such as Bryce and Zion in south Utah. After zipping down from 10,400 feet at Cedar Breaks to 8,200 feet at Panguitch Lake, we cycled the second day from the National Forest campground to the quaint city of Panguitch of about 1,500 at 6,500 feet. I enjoyed the display of quilts down Panguitch's main street as we pedaled through the quiet town and headed to Bryce Canyon National Park. Before we arrived at Bryce Canyon, we pedaled through Red Canyon -- a real visual treat. We left the road and pedaled on a paved trail for about six miles or so through Red Canyon, an aptly-named canyon. After battling headwinds from Panguitch to Red Canyon on US 89, we turned on Utah 12 to pedal through Red Canyon to Bryce Canyon. It was mostly uphill to Bryce, which took 47 miles. For bicyclist tourists who would like to log more miles, Merrick was happy to accommodate them. For example, Elizabeth wanted to bike more miles, so she pedaled another 30 miles during the afternoon or so inside the park, while Nancy and I decided to hoof it down a loop trail at Bryce Canyon National Park. We all met up at our Bryce Canyon camp spot around 5:30 p.m. or so. Here is Nancy checking out the hiking trail info sign and strolling through the walled trail on the way back up to the rim trail. Our Bryce Canyon camp site was only a five-minute walk to the rim, where sunset offered wonderful photos from the rim trail. My third and final day meant trying to pedal from Bryce Canyon National Park to another underrated natural gem -- Coral Pink Sands Dune State Park, some 72 miles away. Biking back from Bryce Canyon to US 89 was pleasant, as it was mostly downhill and it meant another trip through Red Canyon. But when we turned left on 89 and headed north, we bucked ferocious sustained winds of 30 mph. "The Big W," as Zephyr liked to put it, eventually forced us to seek cover and transport via the van to an alternative route, a side road miles down the road that took us back to 10,000 feet elevation and chances to see the lava rocks from ancient eruptions and the headwaters of the Virgin River. We stopped for lunch at Duck Creek at a Dixie National Forest site at about 9,600 feet. Merrick prepared two delicious pizzas and we carbed up for the rest of the afternoon of bicycling. Between cycling from Bryce Canyon to US 89 and then a second mountain segment, we logged 40 miles -- not bad when you consider the nasty winds that forced us off US 89. Kudos to Merrick for crafting an alternative route for us to bike in the mountains and adding more delicious scenery to a great bike trip. We packed out bikes on the van roof and headed for Coral Pink Sand Dunes State Park, where windblown sand made for some fun routes for ATVs at the park. On the third evening, Merrick drove me back to St. George from the sand dunes state park and I headed home to Las Vegas that night. Escape Adventures had provided a marvelous blend of great bicycle routes, amazing scenery, tasty food at three miles and two great tour guides who offered great insight and support. Elizabeth and Nancy continued on to the Grand Canyon's north rim and Zion National Park. For information, contact Escape Adventures at www.escapeadventures.com or 800-596-2953. Every know and then, I post a Gimme 5 on a variety of bicycle stories that catch my eye. 1. Do you moan about biking hills? Check out this fella churning up a steep hill in San Francisco. 2. Speaking of San Francisco, check out this story on mobile bicycle chop shops. 4. An unsung bicycle hero in the Tampa Bay is Mike Olsen of God's Pedal Power, which rehabs hundreds of bikes in Tampa. His group gave 40 bikes to kindergarten kids. Way to go Mike! There's also a new kinda satellite location of God's Pedal Power called South Tampa Bicycle Recyclery. Check that out. 5. Let's be real. Even with bicycle awareness messages on billboards or in PSAs, the first thought that goes through the mind of the vast majority of drivers when they see a bicyclist on the road is, "Great -- someone is on a bicycle in front of me and I can't drive as fast as I want." The worst thing that happens to a motorist when driving on a road with a bicyclist is that motorists can't drive as fast as they want. The worst thing that happens to a bicyclist when driving on the road with a motorist is that we get killed. I want people to know that drivers kill hundreds of bicyclists a year in this country and these cyclists leave loved ones behind and big voids in people's lives. Here are the lives of two people who were killed by motorists recently -- one, a 20-year-old Sarasota Ballet dancer killed by a truck driver in Sarasota. The other was a young man killed by a hit-and-run driver in south Los Angeles. I just met the most mellow motorcyclist, and I'll just call him the Floppy Hat Guy. We met twice this week at the Red Rock scenic loop overlook while we both took pit stops at the haven at 4,771 feet elevation. I thanked him for keeping the noise down from his motorcycle along the loop. Floppy Hat Guy wears a motorcycle helmet while riding, but switches to his floppy hat when sitting and gazing at the Big Stripe at Red Rock conservation area. Floppy Hat Guy said he owns 17 bicycles and five motorcycles. But FHG said there's no way he's riding a bicycle up the steep grade along the scenic loop. Floppy Hat Guy said he takes an early-morning motorcycle ride daily from his home to the scenic loop and back. Here's to you Floppy Hat Guy. Thanks for being a cool and mellow motorcyclist. The California condor is one homely-looking bird, the park ranger explained. The condors piss on themselves and have other quirky habits, he said. But they're a pleasant sight at the Grand Canyon, Mr. Richard Ranger said. One of the fun highlights was bumping into the ranger's chat on the condor in a crude, make-shift mini-amphitheater right on the canyon rim near the Bright Angel Lodge. This weekend was my first visit to the Grand Canyon. And the place lived up to its hype. The sheer vastness is overwhelming. And while most massive three-dimensional land formations are usually mountains, in this case I was looking down instead of up in awe. The good news about the condor is that this once rarely-seen bird is back. And the ranger giving the condor talk hit the jackpot when a condor took flight right behind while he gave his chat. "There's a condor,!" he screamed. "I better get the binos." Just this morning on Sunday there was another park ranger waving a TV antenna-looking device on the rim off a parking lot near the Bright Angel Trail. "I've seen five today," he told me. "The most I've seen at one time was 19." Whoa nellie, the condors are back, big-time. The Rim Trail offers amazing access to the edge and the views. Most of the trail is paved, but there are some dirt sections, too. There's also a separate paved trail for bicyclists, which I checked out. The Grand Canyon draws 4.5 million visitors a year. I heard many different languages being spoken, especially many European languages. "It's a geology book come to life," a ranger told a group near the rim. And the most popular trail is the Bright Angel Trail, which winds its way down to the canyon floor and Phantom Ranch. A sign warns visitors to not try and do the entire Bright Angel Trail down and back in one day because the park said many hikers have died or suffered injuries. Elevation is in the 7,000 range, especially along the Hermit Road stretch, which is open to buses and bicyclists but not cars. The morning is the best time to stroll the rum trail. It's cool and few people on the path. My Top 5 things I learned from being at the Grand Canyon. 1. The elevation. It's up there at 7,000 feet and allows for some decent 85-degree conditions. 2. Everyone wears those floppy tan-colored hats. 3. The Rim Trail is super close to the rim edge, offering amazing views of the big hole in the ground. 4. 685 deaths from falls and other canyon mishaps. And counting. Read more here. 5. Elk hang out like squirrels on the local roads near the visitor center. Tourists cause traffic jams when they stop and gawk. 5A. Lots of tree and shrub cover, including spruce, fir, pine and juniper. And the mules. They're popular around Grand Canyon. There's even a mini-ranch near the rim hotels. If you're cycling in Summerlin on a Thursday evening, chances are pretty good you will bump into Lisa Caterbone's bicycle club/BikingLasVegas.com bicyclists. I was cycling down Charleston Blvd. on my own ride and planned to take the new 215 trail extension when I saw a bike train of white and red lights around 9 pm. I joined in for a few miles including a nice uphill on Far Hills Avenue. Lisa's bike group is perfect for a new road cyclist who wants to gain experience at biking on roads. It's not the hard-charging hammerheads on $5,000 road bikes. It's more casual bicyclists who want to ride affordable road bikes. Check out's Lisa's BikingLasVegas.com web site for more ride info. Grand Canyon Fat Tire Festival -- Be There! 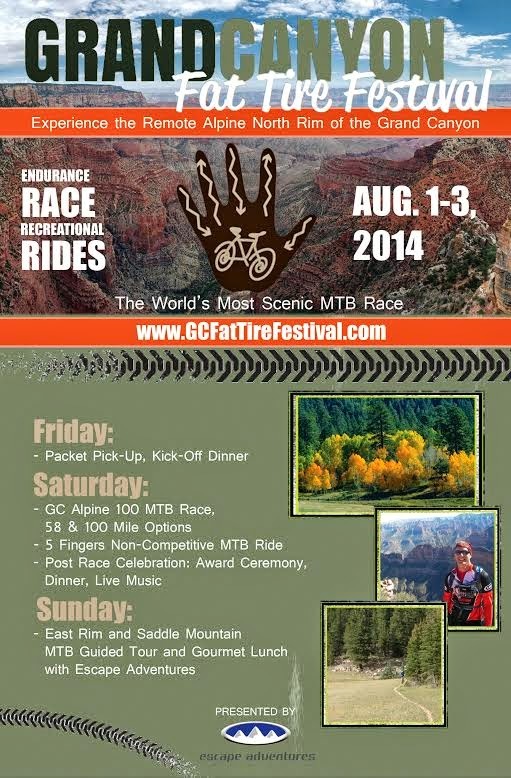 Check out this Grand Canyon Fat Tire Festival being held by Escape Adventures. It's going to be held at the North Rim, which is much more remote and alpine than the commercialized South Rim. It's Aug 1-3. Instead of cycling the Red Rock Scenic Loop, I bypassed the loop entrance in favor of a tremendous ride to Blue Diamond. Both rides are in the 28-mile range but so different. The Loop requires five miles of grinding steep grades to get to the overlook, then zipping down at speeds of 40 mph. In contrast, the State Road 159 route to Blue Diamond and back is more rolly-polly hills with nice vistas of the famous red-striped mountains to the right. Blue Diamond is a cluster of homes off 159. It's a fun bunch with a few quirky residents thrown in there for good measure. The views are wonderful along a relatively gentle sloping road.